That's what he was afraid of. A 2 stroke is just a pump ..and in order to pump efficiently there can be no leaks. 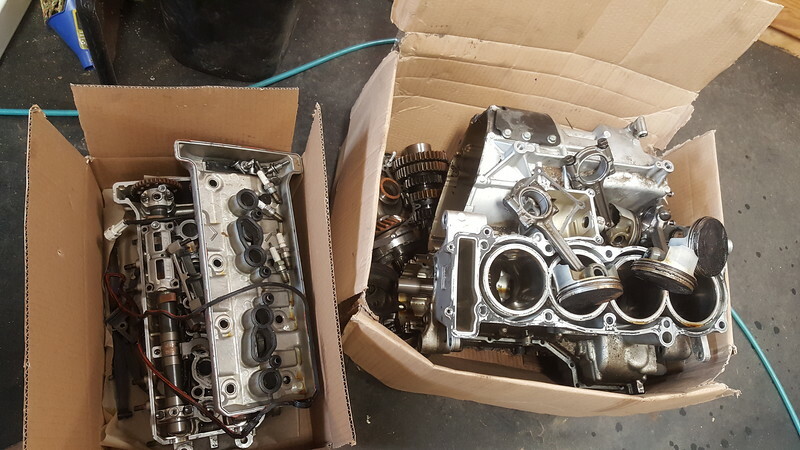 New seals all round, most of which van be purchased at any bearing supply, careful cleaning of mating surfaces and a thin coating of Hylomar on the 2 halves of the crankcase, new cylinder base gaskets, careful port matching should do the trick. Match the profile of the top of the port to the piston skirt bottom as well as matching the intake & exhaust tracts..small changes will yield good results....and if those modest gains arent enough for you then I think any 350 engine from the R5 to the RD350 will fit into that frame. You might also consider changing the swing arm bearings for ones made out of bronze for greater cornering precision. I just want to get it running and to be able to cruise around the neighborhood. Can't you just put a set of pistons, cylinders, heads and carbs off an RD350 right on an RD250? I'm still subscribed - glad to read this thread is resurrected. That motor has a special place in my heart. When I was a kid, everyone wanted the Mach 1 Kawasaki. But I wanted the RD350. 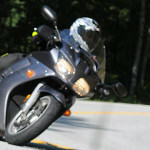 Maybe just a smidge (and I mean a SMIDGE) slower, but the bike could do so much more than go straight. I dont think so...I seem to remember that the bore size in the crankcase is smaller, the crank is different with a shorter throw and the connecting rods are shorter. Hppants wrote: I'm still subscribed - glad to read this thread is resurrected. My late 1970's RD400 was a screamer. Wouldn't think you'd need any engine work to make it track-worthy. bungie4 wrote: Stumbled across this rd250..
CollingsBob wrote: ↑ Match the profile of the top of the port to the piston skirt bottom as well as matching the intake & exhaust tracts..small changes will yield good results....and if those modest gains arent enough for you then I think any 350 engine from the R5 to the RD350 will fit into that frame. You might also consider changing the swing arm bearings for ones made out of bronze for greater cornering precision. It doesn't prove it will work, but the rd250 and rd350 had the same 54mm stroke, the 250 was square 54 x 54 and the 350 was 64 x 54. I could see that the bore being bigger could preclude the jugs working. 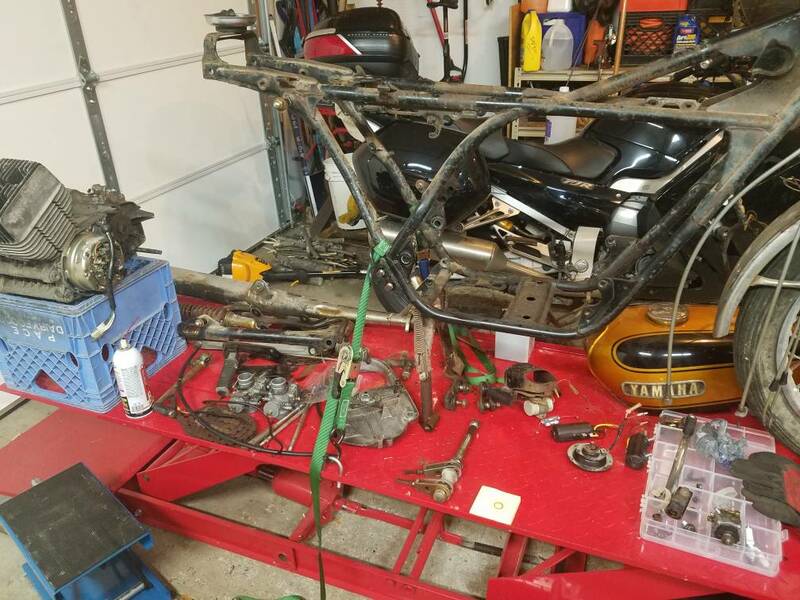 I started out with an R5...then after I blew the transmission I replaced the entire engine with one out of an RD350...then I replaced the front end so that I could replace the drum brake with a singke disk. Then I started port matching, putting extra ports into the pistons, drilling the reed valve stops in order to maximize reed valve lift. Expansion chambers led to an increase in main jet size to 220, at the same time the stock airbox was discarded in favour of K&N’s..Clipons and rearsets got added at the same time as a seat/tank/fairing from a TZ350. By now it was seriously fast, used a shitload of gas and needed pistons once a season. 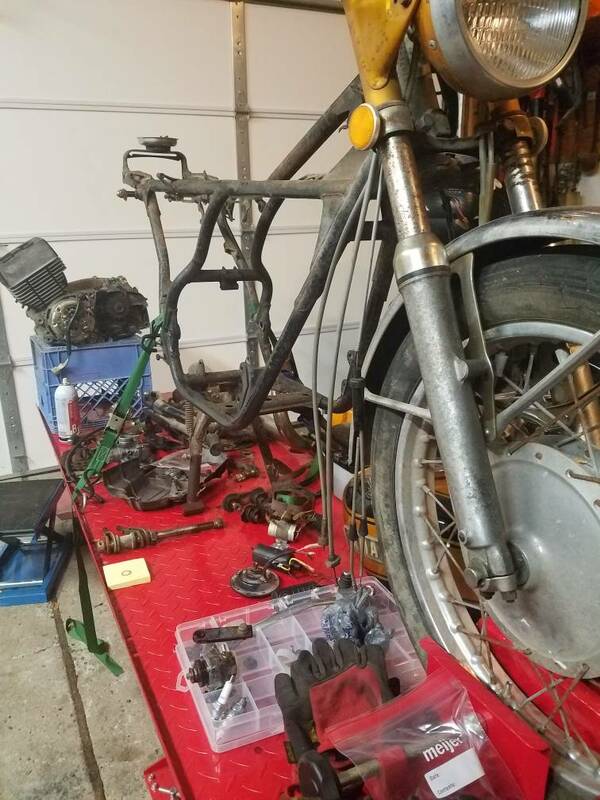 I had succeeded in turning a real nice, kinda fast bike into a stupid fast bike with a light switch for a throttle that was sooo single minded that it was no longer a lot of fun all the time. I sold it and bought a 750 Honda. Not as fast, way more reliable, cheaper on gas..and a fuckton quieter. Now you know why I will never replace the mufflers on my FJR..
Grow a pair!! WE offered to help at Tech Day, but no, you have to do it your way. Just put in in a coupla boxes like I got and figure it out later. You'll remember... really! That RD motor should fit in one box, not two like I got this......... ya gonna come help me? I think it was PhilJet that said it best..
"...still not taking my bike apart at tech day..."